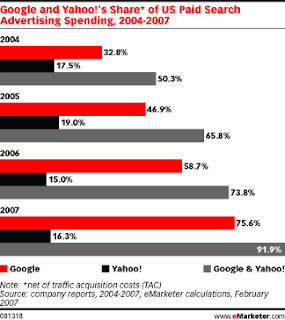 Google & Yahoo Top for Search Traffic….Shocker! I know what you are thinking…. tell me something I don’t know! Or, you could be thinking, what the hell is Cheryl doing blogging on legitimate industry news instead of on her shenanigans in New York? I’ll tell you what, news first, then maybe a wee SES memory. Work hard play hard people! According to eMarketer.com, comScore and Neilsen//NetRatings have reported that 76% of all searches in January 2007 were done on Google and Yahoo! How’s that for breaking news eh? Here’s another story just in, and with an accompanying chart; Over 91% of US paid search spend will go to the two big dogs. Having a hard time containing myself here. Some may look at these stats and stumble down that path towards 2nd tier engines, in the hopes of cheaper clicks. As you may have noticed, I am not a fan. Depending upon your industry and market of course your experiences may differ, but in my 5 years of trying to find more quality leads for less, it has been proven to me time and time again that this is not the answer. I can get cheap clicks all day long on targeted keywords but if they don’t convert for me they are, in a word, useless. In my opinion, the quality of the user is lacking on these engines. I realise I am in a very competitve market and searchers visiting this type of webspace may be higher up in the buying cycle, but I am pretty sure a ‘searcher’ viewing my landing page 85 times in 1 minute…..has seen it enough to know they are not going to buy. You gettin’ me here? In saying this, I do use a 2nd and a 3rd tier engine here in the UK to generate leads….. kind of deflates my rant above. I guess my point is, if you are going to venture out with the puppies of search, be wary and keep a short leash!